A list of cricket books that are on sale and avaliable by contacting Clarence Hiles directly or send an email to info@theulstercricketer.com. Hiltop Publications Ltd, 2013, ISBN 0954589238. Hiles sets the biography of the most famous shipbuilder in history in Comber, the home of the Andrews family, and traces the childhood of young Tommie Andrews from his birth at Ardara House, to Inst School, cricket at The Green and ultimately his meteoric rise to fame at Harland and Wolff Shipyard. The story is of considerable historical interest as very little has previously been known about Thomas Andrews (Jun) other than a small book written by Shan Bullock several months after the Titanic sinking in 1912. The book finishes with the Titanic Story, but from a Tommie Andrews perspective and deals with the huge legacy his death has left in the town and country of his birth. From all accounts Tommie Andrews was a lovely man, a pillar of society and the Non-Subscribing Presbyterian Churches in Comber and Rosemary Street in Belfast. He was a modest cricketer, who played with and against all the best cricketers in Ulster during the embryonic years of NCU and North-West Cricket in 1880 and afterwards. Tommie made his 1st XI debut as a raw 15 year-old and played his last game for the club in 1904 when his commitments to shipbuilding consumed his life. He was a Vice-President of the Northern Cricket Union and although he declined the Presidency on several occasions because of work, it was always expected he would don the role at some stage later in his life. He played in three Junior Cup winning teams and amongst his 1st XI achievements was a top score of 66 against Lisburn in the Senior Cup in 1901. Tommie lived his life to high principles and in the face of adversity Hiles portrays the story of a heroic man doing all that he could to save women and children from the sinking ship. He died a hero and this biography will give him a unique place in the history of local cricket because, as Hiles claims, he was surely "the most famous person to play cricket in Ireland." Hiltop Publications Ltd, 2011, ASIN B00DV31QQA. 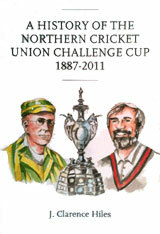 “A History of the Northern Cricket Union Challenge Cup 1887-2011” is a masterpiece of research and chronicles the competition that has been the heartbeat of NCU cricket for 125 years. The publication has been completed to coincide with the Union’s 125th Anniversary Celebrations and is a fitting tribute to past and present players and administrators. The book is a voluminous 552-page treasure for local cricket enthusiasts and is packed with details of over 2,000 cup matches since 1887 including the cup final scorecards. Virtually every year has photographs of the winners. It also includes caricatures of former players and ten beautiful colour sketches of the top grounds. The Appendices list all the top performers including all century makers and bowlers who have taken seven wickets in a match. There is also a comprehensive list of all the umpires. 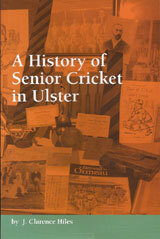 This 400 page tome is widely regarded as the authoritative history of Ulster cricket and deals jointly with the development of the game in both the Northern Cricket Union and the North West Cricket Union areas. It also outlines the social, political and economic scene in which the game was played over the years and goes back as far as 1792 when the first recorded match was played in Dublin. The author was well placed to write the book having been weaned at the famous North Down Cricket Club in Comber and then playing senior cricket before making a significant contribution to the game as an administrator locally, and within the Irish Cricket Union. The book is packed with all the great stories and events that have carved the history of cricket in the province and key personalities like Bishop HH Montgomery, the legendary Andy Macfarlane, EDR Shearer, Dermott Monteith, Simon Corlett, Raman Lamba et al are highlighted. There are numerous photographs throughout and the Appendices has a wealth of statistics and records for the cricket historian. Hiles has also traced the development of the game at international level from an Ulster perspective and lists both international players and umpires that hailed from the province. The book is a must for anyone interested in cricket in Ireland. 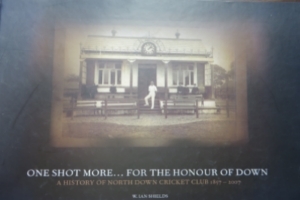 North Down Cricket Club, ISBN 9780955798900. In 2007 North Down celebrated their sesquicentenary in style on the field as winners of the Premier League and Challenge Cup. And off the field they climaxed their first 150 years with a Gala Dinner attended by Sir Everton Weekes. The final act of celebration for 2007 was to record the history of the Club from its foundation in 1857 to the triumphs of 2007. After over two years of painstaking and obviously both stimulating and rewarding research, club stalwart Ian Shields has produced a memorable book chronicling the progress of the Club over the years; and not just the Club's successes but failures too. All, of course, set in the context of a wider history but at the same time focusing on the people who played their part is shaping the club’s development the club over the years. The 177 page hard back book, which is beautifully produced and illustrated by numerous photographs throughout, was enthusiastically received by both club members and guests at the formal launch at The Green.